Thanks to FUMI for providing me with a free purse hook to review. As many of you have probably come to realize, I love jewelry. I have to admit, I don't wear bracelets that often, so I don't have that many. So when I was given the chance to review the FUMI Cheetah Bracelet Purse Hook, I was really excited. 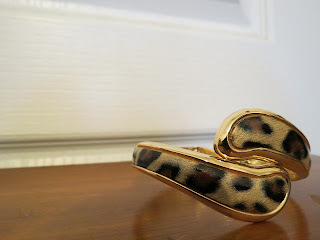 I have a couple different purse hooks now, but while the others can also be used as a bracelet, they definitely don't look quite as pretty, and fashionable as this one. The first thing I noticed was the beautiful, bold gold color on it. It just looks so classy! When you really look close at it, you are really blown away, because even the inside is beautiful designed, and intricate. I tried to get a good picture of the inside, but the angle was really weird when trying to get a close up shot. One thing I really love, is something with multipurpose; I feel like multipurpose items really make the most out of things, which is definitely important to me. The main thing though is that the bracelet purse hanger is really sturdy. I carry so much in my bag (including about 5lbs of change, lol.) and it is really heavy, but this hook was able to hold my bag without any problems at all. Also, when wearing it on my wrist, I can't even count how many times I would bang it on something, and I have yet to see any scuffs. This is a really well crafted purse hook, and it doubles as a great accessory. Definitely worth the price of $24.95. You can connect with Fits in the Purse on Facebook and Twitter. Disclosure: Review product was provided to me free of charge in exchange for this post. All opinions expressed are my own, and were not influenced in any way. Thanks to Tomoson for partnering me up for this review. 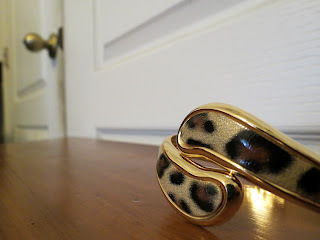 When I first looked at this bracelet, I thought someone had fixed a photo of an animal into this shape. Really cool effect! I've seen these before but never as a bracelet as well, pretty neat! My daughter would love that! Cheetahs are her favorite! What a beautiful bracelet! I love it! I love it! I followed them on Twitter for updates! Thanks so much! I have never even heard of a purse hook! What a great idea. I don't even want to think of the germs I pick up when I have to put my purse on the floor. And this one is so cute! 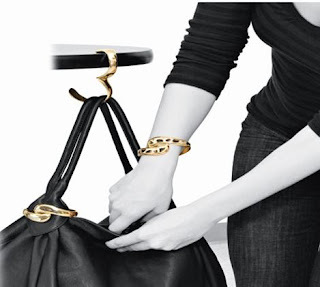 I had never even heard of a purse hook, but I love this idea! I don't even want to think of the germs I pick up when I have to put my purse on the floor. And this one is so cute! This is very stylish... unlike some of the bracelet clips I've seen. Oh cool, you can wear it as a bracelet too. I like the color - very stylish and will go with a lot. This really caught my eye. I usually don't like gold on my jewelry but I love this! these are so much better that those disc. these are fashionable and convenient, they don't take up space in the bag either! love this find! 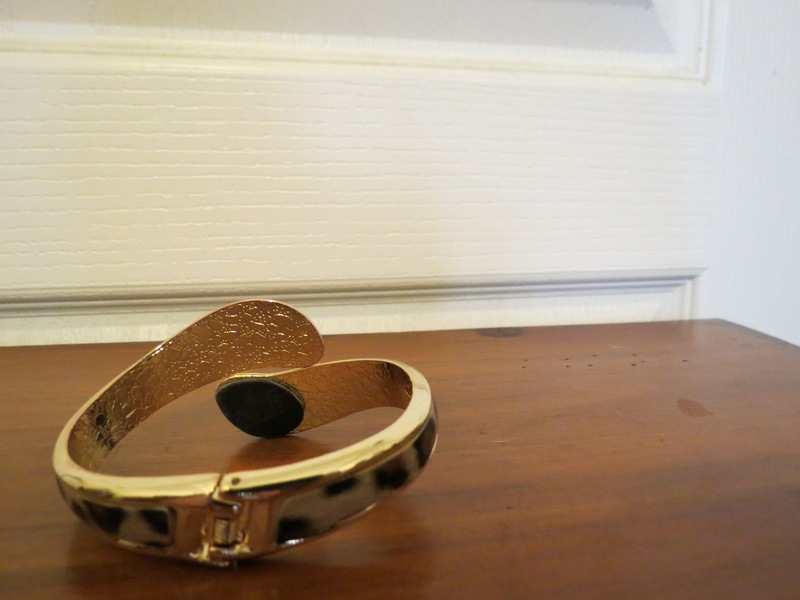 I don't really like it..
it is beautiful, but it is also an ideal bracelet for a thin wrist! Amazing bracelet and very handy. This is really pretty. I love the colors. i'm not sure this would ever make it off my arm to use as a purse holder! it's gorgeous! I have a purse hook and I love it! I always did hate putting my purse on the floor and now I don't have to. I do wish though that it was a bracelet too. That looks awesome, I would love to get it for my partner Louise one day as she too loves multi-purpose items, However Lou likes Silver over Gold as most of her Jewellery is Silver! Awesome product review anyway Amanda! That is a really pretty bracelet. I love the cheetah print. What a fantastic idea! I've never seen anything like this. I hate sitting my purse on the floor when we go places, Thanks so much for this review! Really cute idea! It would be great for a mother's day or teacher gifts. My wife seems to have tons of purses, could use something like this to take them off the floors. I WANT THAT, MUST HAVE THAT!! That looks so gorgeous, thank you for sharing. This one is really efficient as you have a bracelet and a purse hanger in one plus it comes in cheetah design. Beautiful bracelet and it's multipurpose. The one who invented that is a genius! I love an accessory that's also a multi-tasker. Very cool. I don't really like animal prints.. but each to their own..
Hm! I'm usually not a big fan of leopard print but I actually like that! That is really wonderful! Very classy, too! Elegant! I love prints and gold, they blend well and created a classy look. Elegant! I love prints and gold, it creates a classy look! How cute! I didn't even know people made these! I have one of these and really like it! It's best when you are using a public restroom and there isn't a hook on the back of the stall door.